What happens to Google email & online information when someone dies? When people lose someone close to them, they frequently seek to find out more about what they were thinking or doing before they died. It’s as though they are trying to get a complete sense of the person and how they related to everyone else and the world around them. 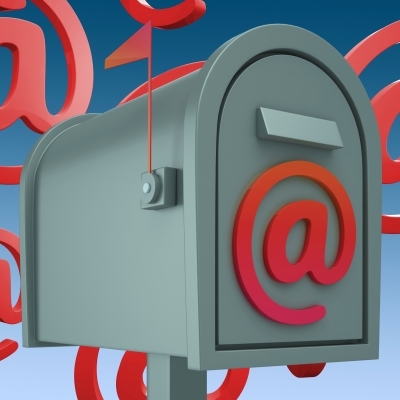 Accessing secure information such as email is one way that mourners have sought to do this. However until recently, Google has restricted the ability of family members to see account information of the relatives who have died. It has required a legal process. The company has stated that their focus is to consider the privacy of users who sign up to their services – whether living or dead. This changed in April 2013 when Google announced that their users are now able to nominate a next of kin or someone close to them which allows them access their account data if the account has been inactive for a period of three or more months. It’s called Google Inactive Manager. This will potentially be an enormous comfort for families trying to delve into their loved ones’ histories, sparking memories as well as a greater understanding of who they were. But what are the consequences? Could it in fact open Pandora’s box? Earlier this year, my folks and I visited an army barracks in Catterick, UK to see some soldiers that my brother, DBS, helped to recruit to his Battalion. It was a good day, meeting some of the officers that he served with and finding out more about the customs, traditions and the way of life that he became part of. Chatting with one of the officers over lunch, he told me that one of the most common questions that families ask when dealing with the news that they have lost someone while on active duty is “did he or she receive my parcel?” They want to know if their son, daughter, spouse or sibling knew that they were in their thoughts and were loved. Even if the recipient hadn’t had a chance to consume or open the package, their families are relieved and grateful if they know it was received. The gift symbolises their act of thinking about and loving them. I was immediately struck by this conversation and could relate to what the offer had said. When I was informed of my brother’s death, my first response was “did he know that I loved him?” not long followed by “but I haven’t sent him his parcel,” a box of goodies that I’d bought a few days prior but hadn’t yet mailed. It is a deeply held regret. By contrast, I knew that my brother had thought of me. Two days later a postcard arrived from him that had taken some time to arrive from overseas, telling me not to worry and that he and his boys were well trained and prepared. He would see me soon. I could hear his voice as I read it and I felt a combination of being elated because I had received his thoughtful message and devastated because its timing was like a punch in the stomach. I had sent DBS several emails in the month prior to his death to his Google gmail account. However, because of the nature of his work, I wasn’t sure that he had received them. He hadn’t replied. Army representatives at his repatriation and funeral, tried to assure me that he may have read them. “Camps often have internet”, they said. “Perhaps he was able to check into his account between duties”. It wasn’t something that I was able to find out definitively from Google though. Initial enquiries by the MOD (Military of Defence) and ourselves to access his account were rebutted. DBS was old fashioned in his approach to communicating with friends. He wrote pen on paper letters and mailed them to friends and family. By contrast, I preferred online forms of communication such as email and social and now believe as a result, that a significant period of my personal history has been lost. By committing his words down on a card, I had a record of his thoughts for me. They were there in black and white. In my initial stages of grief, not knowing whether or not he had received my correspondence meant I had no guarantee — for a while — that he knew mine for him. In military life, it’s a common ritual to send parcels and mail to men and women in the field. Increasingly though in our digital age, emails and notes through social networking platforms have primarily become our means of communicating, symbols if you like, that convey we’re thinking of others. Given this trend, it’s no wonder that we want to see these sent and received messages from behind a username and password. In an earlier post, I mentioned how our family wanted to respect DBS’s privacy when handling data stored on his laptop with our desire to find out more about him. We did this by asking a third party to look through its contents, separating the information he would have wanted us to see from the notes and conversations that he would likely preferred we didn’t. We would have applied the same practice to his email handling if we had been allowed to. This is certainly something I would recommend to families going through this experience of looking through email data of someone who has died, whether they access this information via the Google Inactive Manager or have obtained the right to read it through as the result of a legal process. 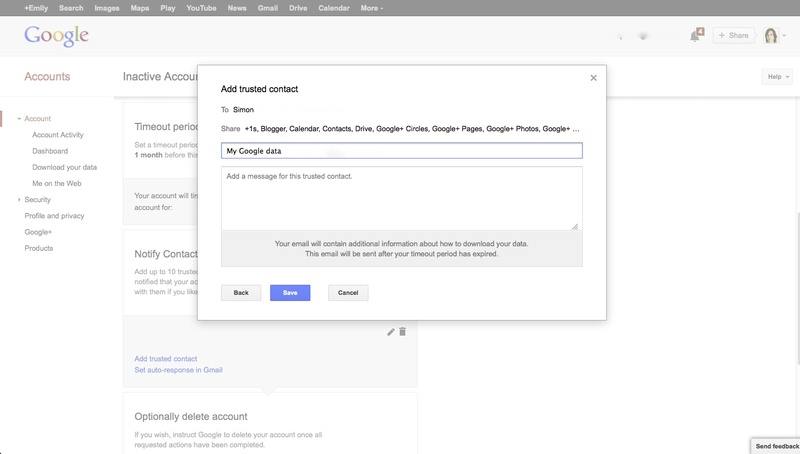 Being able to access a deceased person’s Google account data will likely be beneficial when managing their estate if gmail is their principal personal email account. For instance, resetting unknown passwords to 3rd party services such as iTunes, online banking, other social networking accounts is largely done via email. There are also potential downsides to reading through someone’s private history and relationships. By looking through these archives, you are likely to become privy to a world inhabited by all kinds of private conversations. People often have secret lives, or have done things or have feelings that the people closest them may not know about. Even if this is not the case, online conversations can easily be misinterpreted. Google’s decision to make a user’s private data available to people they have nominated is a positive one, especially if users are considerate in how they manage their settings, balancing their privacy v. providing information that would be practical or of comfort in some way, to their friends and relatives. Having trialled this feature recently, here are some considerations if you decide to take advantage of this function. Google Inactive Manager allows you to decide what Google features and data your next of kin/family members/friends can download in the event of your death. Think about what you want to share. You may want to reveal data from your blog or Google+ circles to those you’ve nominated but not your email. 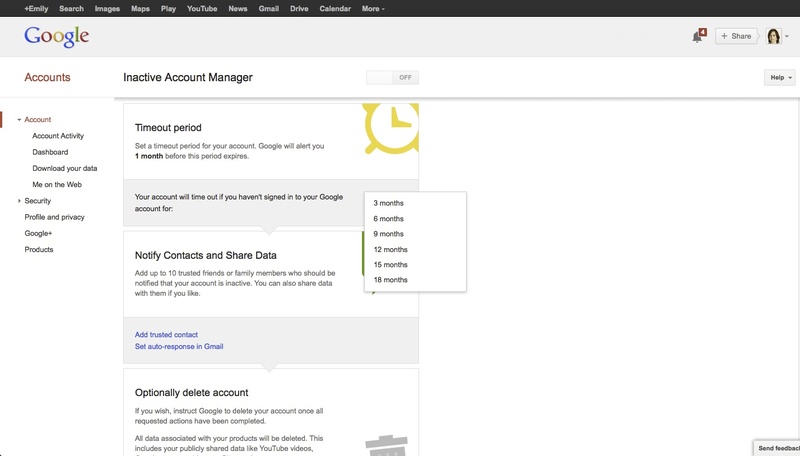 When signing up, there’s a full checkbox list of Google features. Just check the information areas that you would like to disclose. With this kind of digital estate planning, tell your closest kin what you are planning to do and what information you’ve nominated. This way you can discuss what your decision means and there are no surprises later in the event that something happens to you. On a purely practical note, your Google account needs to be inactive for at least three months before your nominated party can download your data. Discussing the steps that you have taken with them means that they may avoid running around in administrative or legal circles trying to obtain this account information in the meantime. 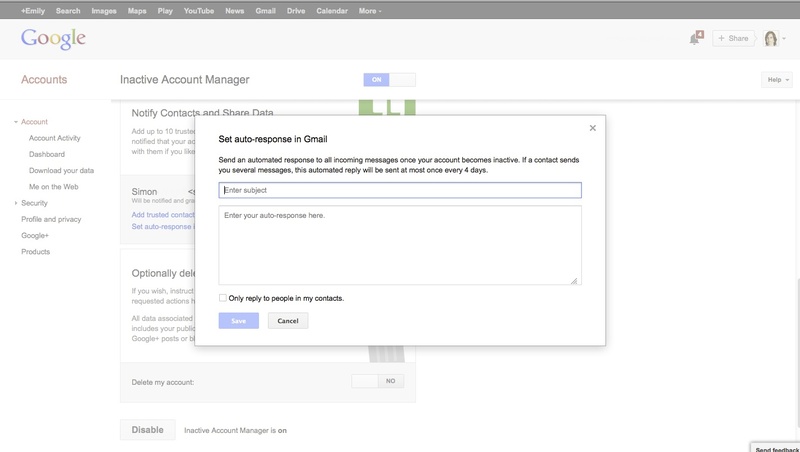 Email accounts hosted by Google but which are instead Gmail accounts with Google Apps (for instance, a business email address), are not supported by this service. 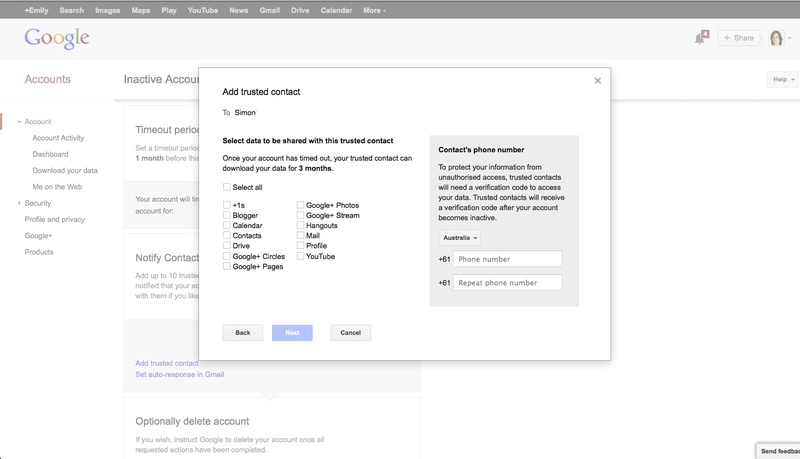 For a Google Apps account, you’ll need to consider an alternative means of sharing data, for instance by setting up someone you trust as an admin on your account. 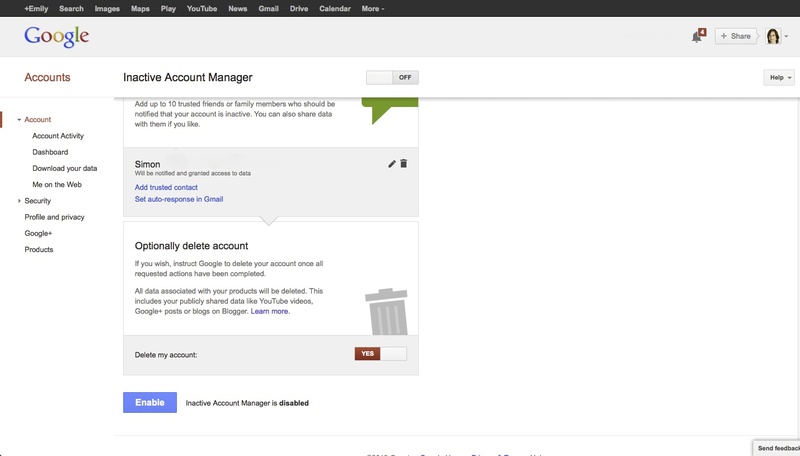 If you have set up multiple personal Gmail accounts (i.e. name@gmail.com) you can set up Google Inactive Manager for each of these. Google Inactive Manager will set into action if you stop using Google and don’t make the service inactive again. It’s important to check in and update this service regularly to ensure that it is reflective of your digital afterlife wishes. Your next of kin or the friends you want to nominate may change over time as may the level and type of information you want to share. You can choose more than one person with whom you share your data. It’s not immediately obvious but if you wish to change the Google information that your previously nominated friends/family can download, click on the edit symbol (the pencil) next to their name. There’s also the option of deleting their access status if you change your mind later. Online service providers change and go out of business as I’ve written about before. Google’s Gmail is showing no signs of abating, however, if you do decide to use another email service and discontinue using Gmail, make sure you deactivate Google Inactive Manager otherwise you’ll be sharing information before it’s time. A false alarm would be awkward, upsetting… and have privacy as well as security implications. 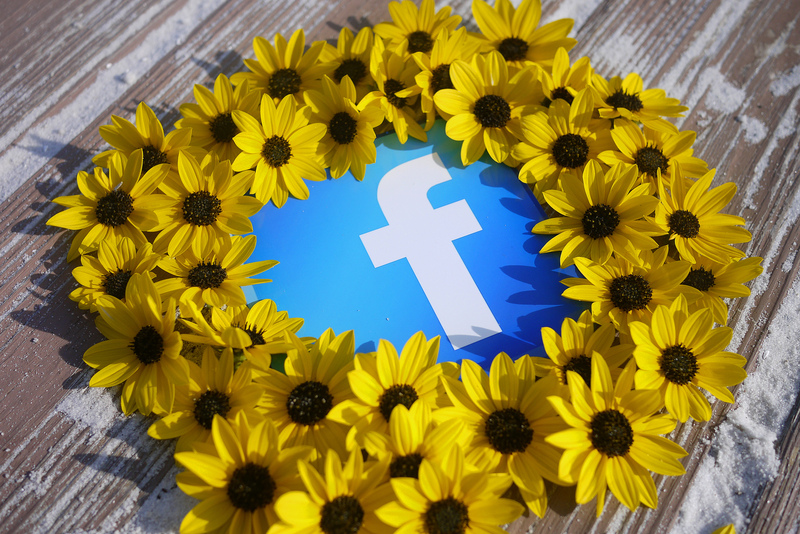 There are lots of services that will charge a fee for you to send a personalised message to loved ones after your death. 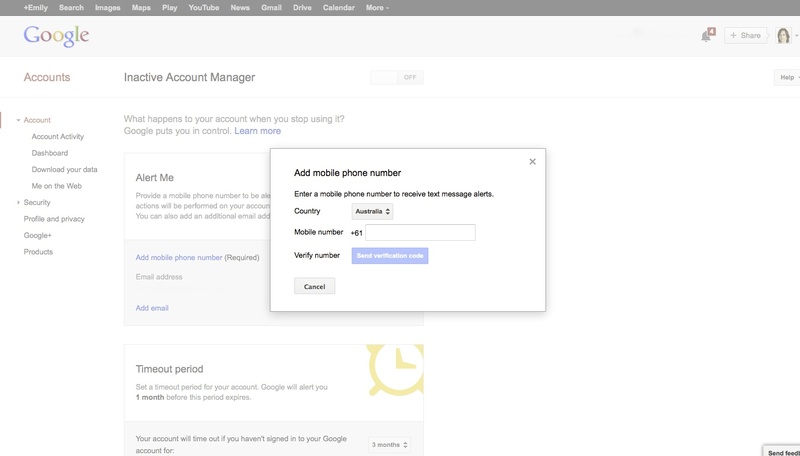 When you set up Google Inactive Manager and nominate the family and friends you would like to share your email or other Google data with, you are able to include a personalised message for each nominee which they will receive once the service is activated. It’s free and part of the opt-in process. While Google Inactive Manager serves a practical purpose, use this message to say something thoughtful. It really will make a difference.